Alisa Damaso is a talented graphic designer and illustrator who took a risk when she left an established career to follow her passion for design. 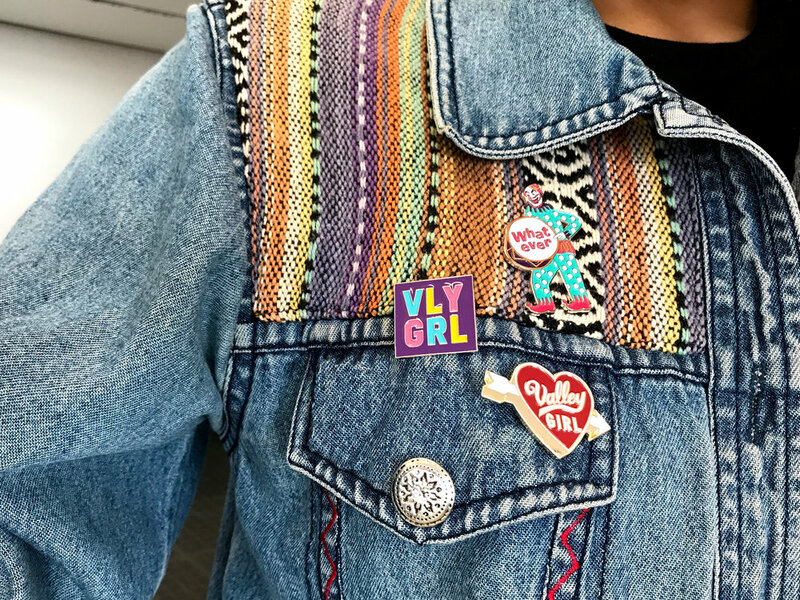 She used Skillshare classes to supplement a certificate program in graphic and web design, and has found success creating work for well-known brands and her own, VLY GRL. We reached out to Alisa after she responded to our call for stories from people who have used Skillshare to help their personal and professional lives. She generously agreed to share the details of her career transition -- and her advice for anyone on the verge of making their own. Hi Alisa! Thanks for joining us. Let’s start with the basics. Tell us a little about yourself! I’m a graphic designer, illustrator, [and] founder and creative director of VLY GRL. I’m originally from the San Fernando Valley outside Los Angeles, and I currently work at a boutique branding agency in San Francisco called Creative:MINT. I also sing in a band called Vincent Gargiulo National Park! When you initially shared your story with us, you mentioned that you had gone through a major career change in the last few years. What made you decide to take the leap into something new? My background is actually in writing and editing. When I moved to SF from LA several years ago, I got my start on the publishing team of an association’s membership magazine, and then after a restructuring, moved over to the communications side to do photography and videography, visual design, and member communications. When I started doing in-house graphic design, I used Adobe Illustrator and InDesign for the first time and I totally fell in love. I started practicing before and after work and even on weekends. I envisioned a future for myself doing graphic design, so I decided to save money, quit my job, and just go for it. Changing my career was one of the hardest existential experiences of my life. During my 10 months of underemployment, aside from the occasional freelance design project, I worked retail for the first time since college; some of the customers treated me absolutely horribly. I developed painful bunions from being on my feet all day, and couldn't afford to do much, so I stayed home most of the time. Applying for design jobs and getting rejected over and over made me feel absolutely worthless, and I worried that I made a terrible mistake by changing my career. But I stuck it out, and eventually found an agency where I fit perfectly. I guess everything really does happen for a reason! [Since then] I’ve worked with clients like Capitol Corridor, Claremont Club & Spa, and Queen Kapiolani Hotel. [Quitting] was the scariest thing I’d ever done, but ultimately the reward was well worth the risk. You also said that Skillshare was a big part of your journey. How did you get introduced to our classes? My partner Ryan, who’s been a designer for more than a decade, helped me realize I was already a designer; I just needed to learn the technical side of it all. So he gave me some guidance and also turned me onto Skillshare. It opened up a new world of possibilities, and it has been so empowering gaining new knowledge through the community of designers, artists, and entrepreneurs on the site. What’s exciting about graphic design is that it’s ever-changing, so the learning never ends. As someone who gets bored easily and needs to be working on something all the time, that’s a huge reason why I saw a long future for myself in this career and decided to dive in. I got my Graphic and Web Design Certificate from the Bay Area Video Coalition (BAVC) in San Francisco, where I received a full scholarship through their TechSF program, which provides technical training to underemployed and unemployed Bay Area residents. The certificate program at BAVC was made up of day-long or weekend-long classes, so you really had to practice on your own to retain the information and keep up the skills. Skillshare helped me make the most of what I learned at BAVC because there’s such a variety of courses to choose from under each subject, so I could keep learning on my own time, at my own pace. Plus, it’s always cool to see each instructor’s design process and workflow so I could see what worked for me and what didn’t. I’ve been recommending Skillshare to friends ever since I started taking classes! Love that! Any classes you consider favorites? Aaron Draplin’s classes are super fun and helped me develop a streamlined process for design. I love all of DKNG Studios’ videos for the same reason. Bonnie Christine and Elizabeth Olwen’s classes on pattern design guided me immensely when I was working on my 100 Days of Watercolor Patterns project, and Mary-Kate McDevitt’s awesome hand-lettering classes made me realize my passion for lettering -- which makes total sense given my love of words. Your success is so inspiring. What are some things you might tell someone who is looking to switch careers like you did? Save more money than you think you’ll need. You never know how long it’ll take to get from A to B. When I quit my job to study graphic design, it took three months to find my paid internship, which was luckily exactly when my money ran out. After my internship ended, it was 10 months before I found my current job. It was rough. Don’t stop creating. I’m a workaholic, so this wasn’t hard for me. The reason I picked up on design and digital illustration so fast was because I spent so many hours obsessively studying and doing it. That obsessiveness helped me develop my skills and build my portfolio, and ultimately got me commissioned design and illustration work. It also helped me cope with months of rejection -- grit goes a long way, and creative expression will help you power through the transition, which can be tough at times. Plus, creating work that speaks to your personal experience will oftentimes be your greatest work and will get you noticed (meaning, get you hired). Make time for self-care. Changing careers is anxiety-inducing, and job searching can be soul-crushing, so it’s important to schedule time for enjoyment and relaxation. Take more walks in nature. Hang out with friends. Take yourself to a movie, the museum or musical performance. Hell, budget for an hour-long massage. It’s so important to recharge mentally and physically, especially for creative people. I am now just learning to say “no” to projects and save some time for myself so I don’t burn out. So go do that spa day. Treat. Yo. Self. To learn more about Alisa Damaso and her work, check out her Skillshare member profile page, her website, her profile on Dribble.com and her Instagram account.